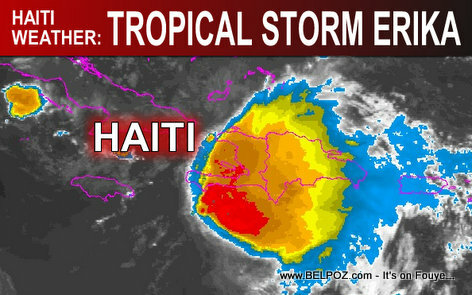 Haiti Weather - Look at this photo Tropical Storm Erika going over Haiti. Enhanced infrared image of Tropical Storm Erika from the GOES-East floater satellite, collected at 0415 GMT Saturday, August 27 (12:15 am EDT). erika pa pase Ayiti bouch pa gou, poch move, kanè bank dekouraje, asazen yo ak raketè gen latranblad. ann rele anbilans pou yo.